A unique housewarming gift for the host who really knows how to make a soiree bloom. A party that leaves you feeling enlightened? That's a thing of beauty. 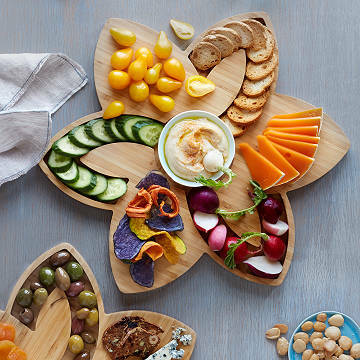 It all starts with Michael and Ania Shepler's lotus-shaped bamboo server, whose petals provide space for all your snacks: cheese, crackers, veggie sticks, and a bowl of hummus or dip in the center. It makes a unique housewarming gift for the host who really knows how to make a soiree bloom. Made in Pennsylvania. 16" x 14" x .75"
Clean with mild soap and water. Wipe dry. Oil every few months with a food safe oil or wax of your choice, hemp oil preferred.